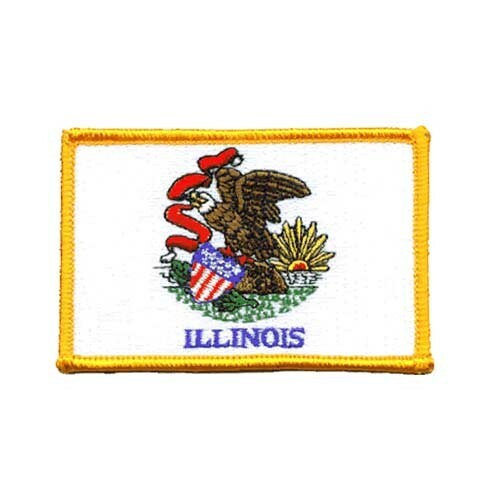 Illinois became the 21st US state on December 3rd, 1818. Illinois was founded by two French explorers, Jacques Marquette and Louis Joliet in 1673. In 1679, French settlers arrived and established the first settlement of Cahokia. Great Britain later gained the area during the French and Indian Wars in 1763. Illinois originally had a state flag in 1913 which chose Lucy Derwent’s submission of the Great Seal of the State of Illinois, which had been created in 1868, on a white background. The flag depicts a bald eagle, symbolizing the United States, perching itself on a rock while carrying a shield in its talons. The shield is of the original 13 stars and stripes. In its beak is also a red ribbon, reading State, Sovereignty, National, and Union. However, Sovereignty is upside down. The dates on the rock, 1818 and 1868 are the years Illinois became a state and when the current Great Seal was picked up. The flag was eventually redesigned in 1970 by a Mrs. Sanford Hutchinson. In the newer version, the name Illinois now reads underneath the eagle in blue. There is also ground around the rock the eagle sits on alongside a sea and a sun in the background. The ground by the rock represents the soil of Illinois. Illinois is known as the Land of Lincoln, for Abraham Lincoln, the 16th President of the United States. Although Lincoln was born in Kentucky and spent his childhood in Indiana, he moved to Springfield, Illinois (which eventually became Illinois’ capital) in 1830 where he eventually became a lawyer. He gained fame during his campaign for Senator of Illinois thanks to his debates with his Democratic opponent Stephen A. Douglas. Although Lincoln lost the election, it helped pave the way for his presidential nomination just a few years later. Lincoln, as President, helped abolish slavery during his term. He created the Emancipation Proclamation in 1863 that freed the slaves within the Confederacy. He also delivered his most famous speech, the Gettysburg Address, that same year. He delivered it at the dedication of the National Cemetery in Gettysburg, Pennsylvania in which he began with the famous, “Four score and seven years ago”. Tragically, Lincoln was assassinated on April 14, 1865 at the Ford’s Theatre in Washington by John Wilkes Booth, who was an actor. He was there with his wife to see a play called “Our American Cousin”. Booth’s motive for the assassination was that he believed he was helping the South. Lincoln is interred just outside Springfield at the Lincoln Tomb State Historic Site. Mississippi becam e the 20th state on December 10, 1817. Hernando de Soto, the Spanish explorer, founded the land as early as 1540 and the first settlement was established around sixty years later by Pierre Le Moyne d’Iberville. Control of the state had been changed several times from Spain, France, and Great Britain until 1798 when the land was organized to create the Mississippi Territory. It later became a state in 1817. Mississippi has flown many state flags in its history, dating all the way back to 1682 when they flew the Bourbon Flag of France. The current flag of Mississippi was adopted in February 1894, replacing the previous Magnolia Flag that had been flown after Mississippi seceded from the union. 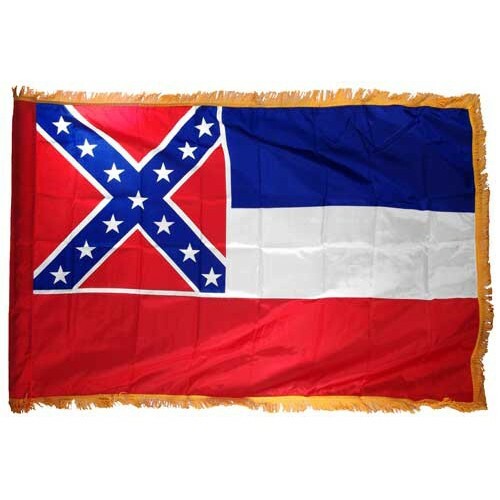 The current flag of Mississippi has the Confederate Battle Flag, a blue cross with 13 stars representing the Confederate States, edged in white on a red background, in the upper left hand corner. The three colorful bars, blue, white, and red, are horizontal on the rest of the flag. There is much debate on changing the state flag as it has the Confederate Flag on it. Citizens and legislators have tried for years to adopt a new state flag for Mississippi. However, many voted against changing the flag because they still value its historic significance. As of this writing, Mississippi is the only state flag with any part of the Confederate Flag on it. Mississippi got its name from the Chippewa words mici zibi, which means “great river” due to the Mississippi River that runs along that state, or the Algonquian word Messipi. Indiana is the 19th state to enter the union on December 11, 1816. Indiana was originally part of the Indiana Territory, formed in 1800. This territory included surrounding states Illinois, Wisconsin, and some areas of Michigan and Minnesota. While Indiana was part of the Indiana Territory, the capital was Vicennes from 1805 until 1813, when it was changed to Corydon. By 1825, it had again changed to Indianapolis and has remained ever since. A constitution was later reached in 1916, thus giving Indiana its statehood. 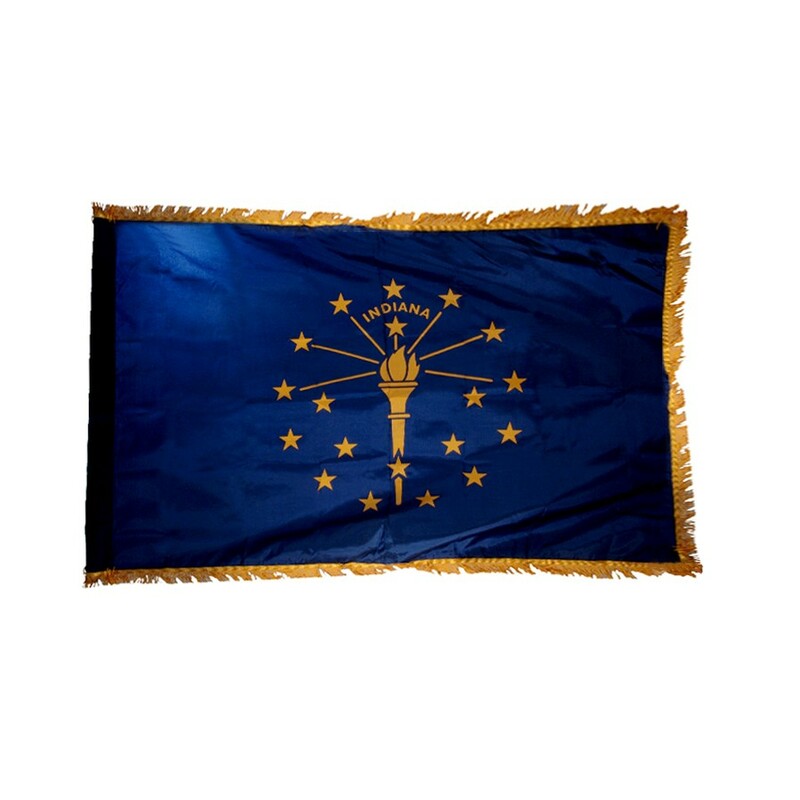 Indiana’s state flag was designed by Paul Hadley of Mooresville, Indiana and adopted by the Indiana General Assembly in 1917. His design was chosen as the winner in a design contest sponsored by the Daughters of the American Revolution at the Indiana state centennial in 1916. The flag is blue with 19 gold stars emblazoned on it. The first five stars connected to the torch in a semi-circle symbolize the states admitted to the United States before Indiana but after the original 13 colonies. The star above the torch is the Indiana star along with the words Indiana written in yellow. Although Abraham Lincoln was born in Kentucky, he moved to Indiana at the age of 7 with his parents and grew up in Indiana. His childhood home in Spencer County, Indiana, is now a museum. Hoosiers: Indiana is known as “The Hoosier State”. People from the state of Indiana are known as Hoosiers but no one knows for sure where the term originated from. Some believe it’s a term people used to describe the early settlers of Indiana, others believe it is shortened from “Who’s your relative?” These are just two of the rumored origins of the term Hoosier. Name Origin: Indiana means, “Land of the Indians”, named in 1800. Memorial Day Tradition: The Indianapolis 500, also known as the Indy 500 race, is held each Memorial Day weekend. It has been held at the Indianapolis Motor Speedway since 1911.